Burlington's favorite son promised a "political revolution" Tuesday as he kicked off an improbable campaign for the nation's highest office. 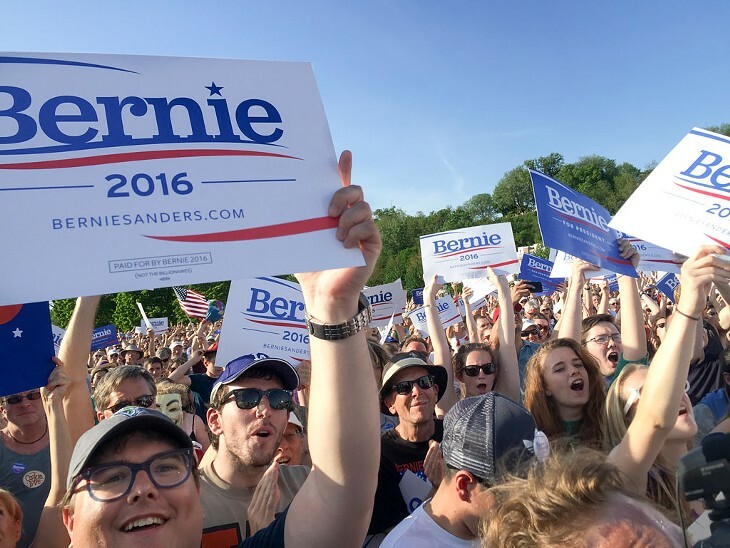 Judging by the 5,000 supporters who packed the Queen City's sun-soaked Waterfront Park, Sen. Bernie Sanders (I-Vt.) will not fight that revolution alone. "This is an emotional day for me," the 73-year-old senator said, his voice cracking as he prepared to deliver a speech decades in the making. "Not just for what I'm going to be announcing, but to see so many people here and to hear what's been said. Thank you very much." 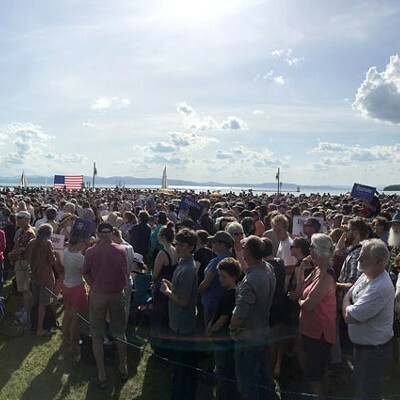 With the sun descending over the Adirondacks and Lake Champlain, Sanders declared: "Today, here in our small state, a state that has led this nation in so many ways, I am proud to announce my candidacy for president of the United States of America." And so began the culminating act of Sanders' 44-year political career, whose peaks and valleys rival those of the Green Mountains. A perennial electoral footnote turned populist powerhouse, Sanders has shocked the political establishment time and again since he won Burlington City Hall in 1981. With his voice echoing off the cliffs below Battery Park, he promised to do so one more time. "Today we stand here and say loudly and clearly: Enough is enough," he said, his right index finger jabbing at the hot, spring air. 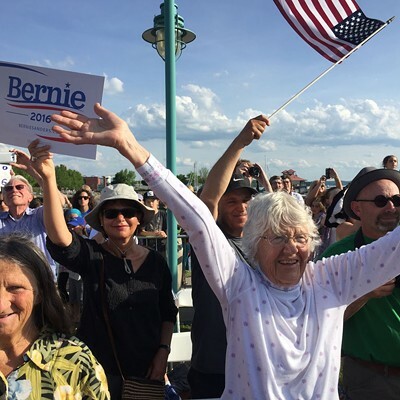 "This great nation and its government belong to all of the people — and not to a handful of billionaires." Sanders promised to "take this campaign directly to the people: in town meetings, door-to-door conversations on street corners and in social media." And whether or not the mainstream media pay him any heed, he said, he will take the campaign to every state in the country. "Let me be clear: This campaign is not about Bernie Sanders. It's not about Hillary Clinton and it's not about Jeb Bush or anyone else," he said. "This campaign is about the needs of the American people — and the ideas and proposals that effectively address those needs." If Sanders' goal was to raise every issue he's ever fought for, he could have declared victory Tuesday evening and called it a campaign. In his 35-minute stem-winder, the septuagenarian senator sounded the alarm against income inequality, campaign corruption, climate change and much, much more. For just a brief moment near the end of his address, Sanders deviated from his domestic obsessions to inveigh against "an endless war in the Middle East," drawing sustained applause for his vote against the Iraq War. Then he touched down on another "faraway land called Brooklyn, New York," where his father worked as a paint salesman and his family lived in a tiny rent-controlled apartment. "My mother's dream was to move out of that small apartment into a home of our own. She died young and her dream was never fulfilled," Sanders recalled. "As a kid I learned, in many, many ways, what lack of money means to a family. That's a lesson I have never forgotten." The sea of woodchucks and flatlanders took it all in, cheering and booing at all the appropriate moments. When Sanders declared that banks "too big to fail" are "too big to exist," one man yelled, "Give 'em hell, Bernie!" Like at a Grace Potter concert, thousands swarmed the grassy expanse of lakeside terrain. They paddled kayaks near the shore and watched from motorboats anchored beyond. 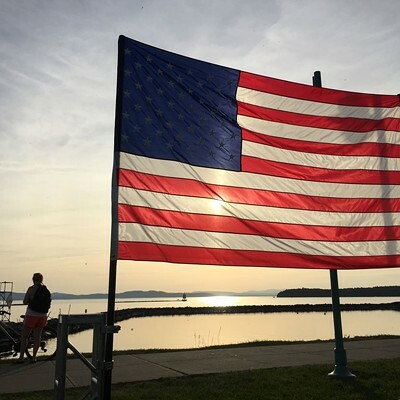 A sailboat puttered by with an American flag hanging limp in the still evening air. Some had seen such a scene before. 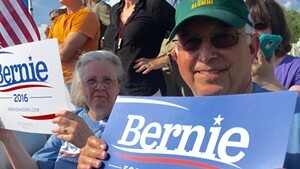 Bob Zimmer, a gray-bearded, gray-ponytailed Colchester man, sported a "Vermonters for Howard Dean" T-shirt featuring the date of the former gov's own presidential kickoff: June 23, 2003. "I remember the last one," Zimmer said of Dean's Church Street announcement. "There was a lot of really positive energy. I'm feeling the same here." Familiar faces dotted the crowd. Members of Sanders' national media fan club, such as MSNBC's Ed Schultz and The Nation's John Nichols, were on hand. Seemingly half the Vermont legislature was in attendance, dressed in T-shirts and shorts. 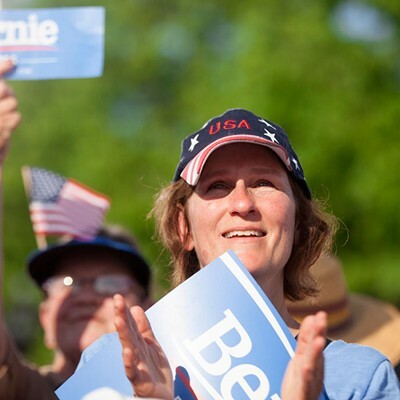 Former Democratic House member Mike Fisher collected signatures for the Sanders campaign, while former Vermont Progressive Party chairwoman Martha Abbott signed up supporters for the state's left-leaning third party. "I'm here because it's historic," said Abbott, who first ran for governor on the Liberty-Union ticket in 1970, a year before Sanders' inaugural Senate run with the same party. "I think people will be surprised by the support he'll get from different, diverse portions of the electorate." Sanders said much the same as he wrapped up his remarks, his blue dress shirt soaked with sweat. "To those who say we cannot restore the dream, I say just look where we are standing," he said, referring to the park he fought to create as mayor of Burlington. "The lesson to be learned is that when people stand together and are prepared to fight back, there is nothing that can't be accomplished." 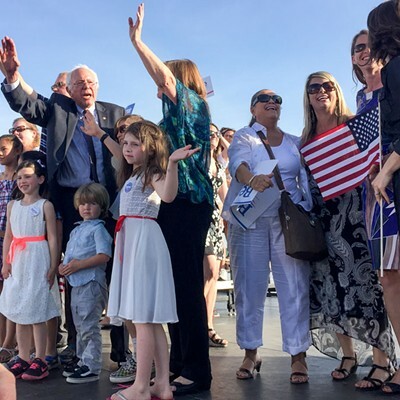 After embracing his wife, Jane O'Meara Sanders, and posing for photographs with his children and grandchildren, the candidate jumped into a waiting Jeep 4x4, which slowly picked its way through the crowd. Fittingly, the vehicle was piloted by Jeff Weaver, Sanders' newly named presidential campaign manager and one of his longest-serving aides. Nearly 30 years ago, after Weaver was expelled from Boston University for anti-apartheid protesting, the St. Albans and Highgate native signed up to work for Sanders' ultimately unsuccessful 1986 gubernatorial campaign. "He's been a part of our lives forever," O'Meara Sanders recalled last Friday in the downtown Burlington campaign office she shares with the candidate. "In '86, [Weaver] came every morning at 6:30 in the morning. They'd get home at midnight [after] driving around the state." Speaking earlier that afternoon in an empty conference room next door to the Sanders' office, Weaver said he never would have anticipated an event like Tuesday's. "No, absolutely not," he said. "But we're a long ways from 1986, when he and I were driving around in my Ford Pinto." Weaver spent 23 years, off and on, guiding Sanders from quixotic campaigns to the U.S. House and finally, in 2006, to the U.S. Senate. After serving as his Senate chief of staff, Weaver left in the summer of 2009 to start Victory Comics, a 3,500-square-foot comic book and gaming superstore in Falls Church, Va.
A lifelong comics fan, Weaver says he truly "caught the bug" after he and a friend came upon what he describes as "one of the premier, golden-age comic book collections ever discovered," in a Shenandoah farmhouse. Known as the "Lost Valley" collection, the cache was worth hundreds of thousands of dollars at the time and included the famous "Detective Comics No. 27," in which Batman made his debut. Weaver, who lives in Falls Church and has three children, says Sanders lured him back to politics over email earlier this year. "I think we sort of figured out pretty quickly, given our experience together, that it would probably be a good fit," Weaver said. "I think he wanted to have somebody on the campaign who would make sure that it reflected his values even as we go national." Sanders has, indeed, hired a handful of Washington, D.C., hands. Tad Devine, an alum of Al Gore's and John Kerry's presidential campaigns, signed on as a senior adviser. Revolution Messaging, which includes several Obama veterans, is running his digital operations. And Michael Briggs, Sanders' longtime Senate spokesman, is heading up the campaign's press shop. But the candidate's new home base — a spare Church Street office suite two stories above Von Bargen's Jewelry — was filled last Friday with Vermonters, members of Sanders' new and old guard alike. "Jeffrey, when you have a minute," Sandernista Phil Fiermonte said as he ducked into the conference room to grab Weaver's attention. A former labor organizer and Burlington city councilor, Fiermonte has worked for Sanders for 16 years, most recently as his state director. He will serve as the presidential campaign's field director. Across the office, Winooski city councilor and former Vermont Progressive Party executive director Rob Millar plugged away at a computer in a dark cubby office. Nick Carter, a Sanders campaign aide for the past year and a former Planned Parenthood of Northern New England lobbyist, corralled volunteers. Like any headquarters of a just-launched campaign, Sanders' was devoid of decor but brimming with excitement — and boxes of T-shirts. 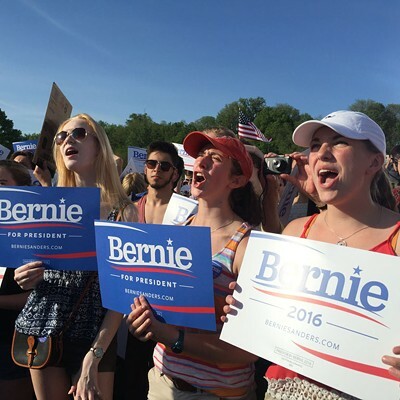 Though many in the Beltway media see Sanders as a spectacle or a sideshow, this was a crowd of true believers. Asked if he thought the Vermont independent stood a chance against Clinton, Weaver answered without hesitation. "I do think he can win," he said. "I wouldn't be here if I didn't think he could win." Nobody believes that more than Sanders' most influential adviser: his wife of 27 years. "It was a major decision — quite a commitment," O'Meara Sanders said of her husband's plan to enter the race. "We didn't want to get in it unless we thought he could go all the way." O'Meara Sanders, who met her husband the night he won his first mayoral race in 1981, says she plans to play a major role in the presidential campaign's strategy and fundraising. For now, she says, she's doing a little bit of everything. "I feel like I'm the little boy with the finger in the dam right now, because it's whatever comes up that has to get done until we're fully staffed up," she said. 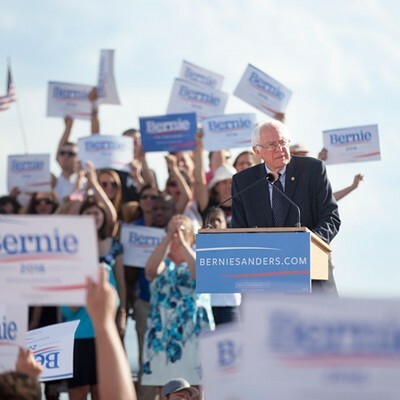 In the month since Sanders formally entered the race with an email to supporters and a low-key press conference outside the U.S. Capitol, the campaign has hired some 15 to 18 people, Weaver estimates. That's less than the 19 already staffing Clinton in New Hampshire alone. "By the time it's all said and done, it'll be conceivable you could have well over 100 people between headquarters and state operations," Weaver said. 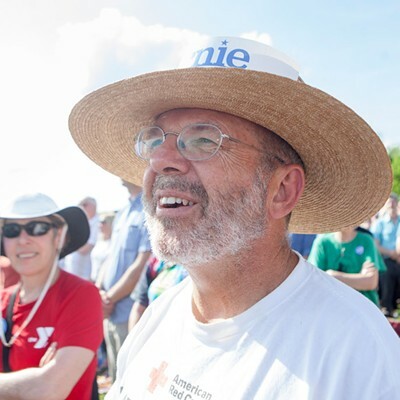 Among the first hires was Pete D'Alessandro, a veteran Iowa organizer who will coordinate Sanders' efforts in the Hawkeye State. 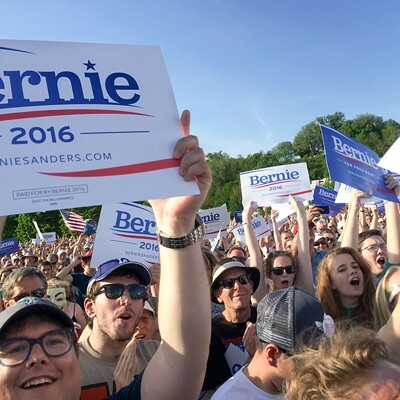 Iowans, he said, "expect very serious campaigns, and there is no doubt that Sanders plans to run a very serious campaign." "I believe in my heart that Sen. Sanders has the ability to attract and appeal to those intense caucus-goers who just really buy into the system," he said. Burt Cohen, a former New Hampshire Senate majority leader, thinks the same about Granite State voters. "I think he's going to resonate very well here — not just with liberal Democrats, but with a lot of the good people who were drawn to the Tea Party because it seemed to be the only populist game in town," Cohen said. "Bernie's the guy. He's for real. And what he says is not poll-driven." Poll-driven or not, Sanders is already registering in surveys of New Hampshire and Iowa voters. An early May poll of the Granite State conducted by Bloomberg clocked him at 18 percent, well ahead of anyone not named Clinton. A Quinnipiac University poll from the same period showed him earning 15 percent of the Iowa vote. Sanders has warned political pundits not to underestimate him. No doubt the army of supporters at Tuesday's kickoff would agree. The original print version of this article was headlined "Bernie Begins"